The top Quotes for Self Esteem, Motivational Quotes, Inspirational Quotes, Self Esteem Quotes, Self Image Quotes, Self Worth Quotes. Enjoy! Don't ruin a good today by thinking about a bad yesterday. * Every day is a new day! Stop hating yourself for everything you're not, and start loving yourself for everything you already are. It's not what you are that's holding you back. Learn to love yourself, and don't put your self-worth into the hands of those who don't love you. Whatever you believe about yourself on the inside, will become a reality on the outside. If you allow other people to make you feel inferior, you will remain their prisoner. ​Be yourself. Because an original is worth more than a copy. I'm not special like you, I'm special like me. We are all unique and valuable. There is something inside of you greater than any obstacle! Don't worry if someone doesn't like you. Most people are struggling to like themselves. 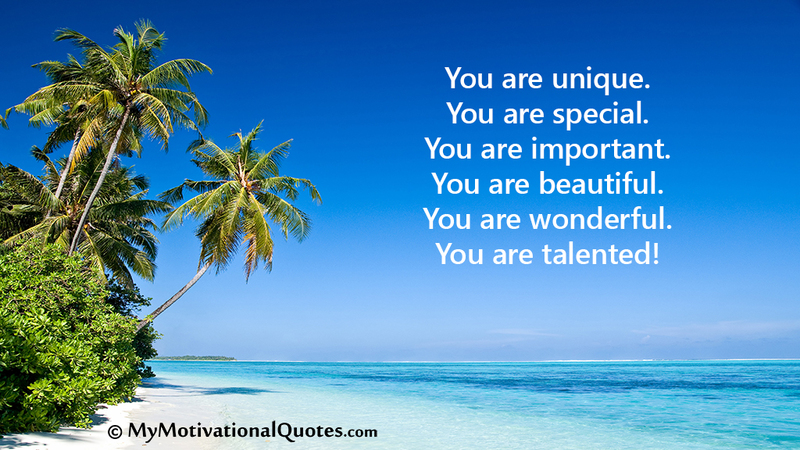 Enjoy these motivational Quotes for your self esteem. They are designed to motivate you, inspire you, and give you a great feeling of self worth. You are unique and special. There is only one person on earth like you. You are valuable!